Woden is going up, with areas rezoned for high-density development and building heights of up to 28 storeys permitted in the Town Centre, under the revised draft master plan. Land in Woden Green near the corner of Hindmarsh Drive and Callum Street as well as along Athllon Drive has been rezoned to allow up to six storeys. Building heights around the Town Square will be potentially up to 28 storeys, as well as selected sites where marker buildings will be permitted to ‘assist the identification of the centre”. There will have to be at least three hours of winter sun on the Town Square, as well as adjoining dwellings. But according to Woden Valley Community Council President Fiona Carrick overshadowing will be considerable. She could not understand how 28-story buildings in the Town Centre will encourage private sector investment. “Who’s going to set up a cafe without enough sun,” she said. The revised plan also includes requirements for building setbacks and active frontage to ensure “interesting and safe public spaces for pedestrians”, as well as awnings to ensure all weather protection along the main pedestrian areas. A convenience store will replace the planned supermarket east of Callum Street, with the area provided reduced from 1500 square metres to 500 square metres. It retains the existing planning requirements for community facilities, and proposes additional land for future facilities. But Ms Carrick said this was insufficient, especially as many community facilities such as the CIT had already been ripped out of Woden or were ageing like the library and in need of a makeover. 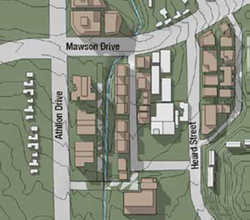 She was concerned about the lack of open green space in the revised master plan, including the rezoning of Arabanoo Park opposite the bus interchange for community-facility use, which could mean housing. There was also a lack of connectivity, with the east-west link from the library through to the bus interchange and connecting bike paths to the Town Centre not defined. Ms Carrick said the plan did not identify an entertainment precinct or place for the community to meet and socialise, and was a missed opportunity to integrate with the planning for light rail. The revised draft plan will now go to the Legislative Assembly’s planning and urban renewal committee. Submissions can be emailed to committees@parliament.act.gov.au by close of business September 15. People often sling off at Callam Offices, but I don’t see why. They, and Campbell Offices, are at least interesting, if not beautiful, and in a way that is not just a monument to the architect’s ego. ‘One of the world’s most liveable and competitive cities – welcoming to all. As a government and as a community, we must build on that feeling, and create that future, together’. Cities don’t succeed by accident or by leaving things to chance – they require design, good governance and great collaboration’. The draft Precinct Code for Woden is great for developers but does not meet the needs of the community. I fear the opportunity to improve the vibrancy of Woden and identify an entertainment precinct that will be an attractive place where people want to be is being missed. 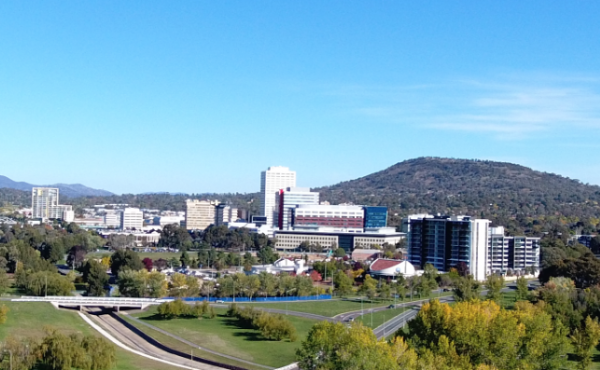 It is difficult to see how the Chief Minister’s vision for Canberra is being implemented in Woden. We are not aware of any outcomes from the Woden roundtable. The Woden Town Centre has always been a bit of a mess, to be honest. It seems it was used by planners and developers to trial a range of unsuccessful approaches, which were then left to drift on in semi-completion. There was supposed to be a proud army of office pods marching across the landscape, rather than the rather pathetic 3 represented by Callam Offices (Battlestar Galactica), they were to connect to the interchange via that crazy dead end deck over the Interchange so beloved of drug dealers and youthful lovers . The area around Lovett Tower is one of the coldest, bleakest and windiest spots in Winter. The Alexander and Albemarle buildings have been abandoned for 7 years and are now home only to pidgeons and crows. Instead of a lake (or really large settlement pond) Woden got a Cemetery. There is no end to the examples of poor planning and worse execution in this ugliest of the Canberra Town Centres. If the newest plan goes some of the way to redressing some of the crapulent plans of the past I will be delighted and truly amazed.